Some would argue Mirela Rahneva was born to compete. Afterall her mom was an elite sprinter, and her dad a competitive acrobatic gymnast. Once the family moved to Canada from Bulgaria in 1997, she recalls her dad marking out a 100-metre sprint track on a bycycle path. Her father would get out a stopwatch to time Mirela. The process was reapeated over and over through her childhood. Little did Mirela know this precious time spent with dad was the foundation of her Olympic journey, paving a trail for a life in high-performance sport. Mirela was a standout rubgy player in high school and at the University of Guelph. Following a short stint on the National Team playing rugby sevens, Mirela was inspired by teammates, and former rugby and bobsleigh star – Heather Moyse – to explore the sliding sports. 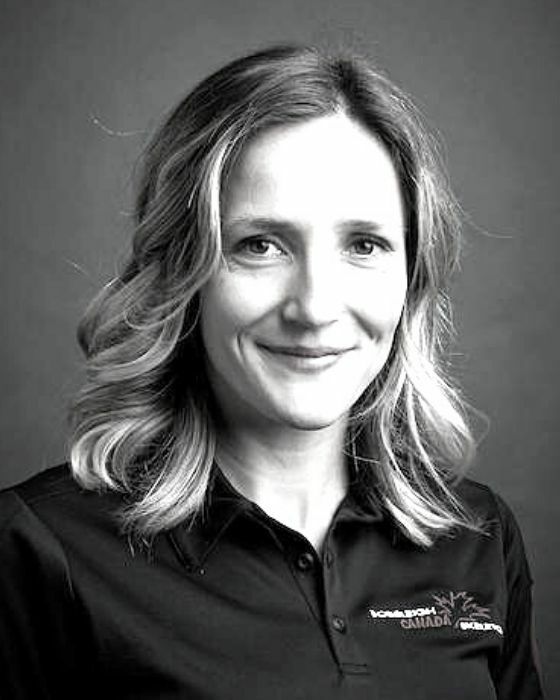 Originally focused on bobsleigh, Mirela realized she was too small, but after a successful testing camp, was encouraged by Bobsleigh Canada Skeleton officials to look at skeleton. Mirela has never looked back. Leveraging those early days sprinting on the sidewalk at home as a child, Mirela is one of the most explosive athletes off the skeleton start block, which has helped her quickly progress through the Canadian ranks. Mirela enjoyed a breakout season two years ago in her rookie season on the World Cup Team, racking up four World Cup podiums and finishing third in the overall standings. After a 12th-place finish at her Olympic debut in PyeongChang, Mirela is now focused on sliding towards the podium in 2022 Beijing. A hard worker both on and off the track, Mirela finds a unique balance in her life between training, competing, earning a few extra dollars while working in the catering department at Canada Olympic Park – her home training venue – and most importantly, spending precious time with family. Mirela has a Bachelor of Commerce (specializing in tourism management). Before moving to Calgary full time she was a wedding planner at Luxe Destination Weddings.